According to Brandweek, “brands are the express checkout for people living their lives at ever increasing speed. This article shows you how, and why, to add “app”-like icons to your sites for several mobile and desktop browser displays, to clearly and elegantly identify your site with an icon that stands out from the crowd. When I was a lad growing up in rural America, we only got four channels on television, all local affiliates of the four national networks (yes, four; you’re forgetting PBS, which I only watched when they did dinosaur specials). The ABC and CBS stations came in fairly clear if you adjusted the “rabbit ears” antennae just right, and wrapped tinfoil on ’em. According to Brandweek, “brands are the express checkout for people living their lives at ever increasing speed. This article shows you how, and why, to add “app”-like icons to your sites for several mobile and desktop browser displays, to clearly and elegantly identify your site with an icon that stands out from the crowd. When I was a lad growing up in rural America, we only got four channels on television, all local affiliates of the four national networks (yes, four; you’re forgetting PBS, which I only watched when they did dinosaur specials). 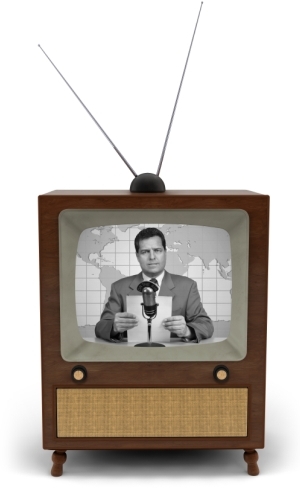 The ABC and CBS stations came in fairly clear if you adjusted the “rabbit ears” antennae just right, and wrapped tinfoil on ’em. NBC’s station came in over the new-fangled and somewhat unfathomable UHF channels — we had to actually twiddle a dial that looked like an old radio selector to tune it in. 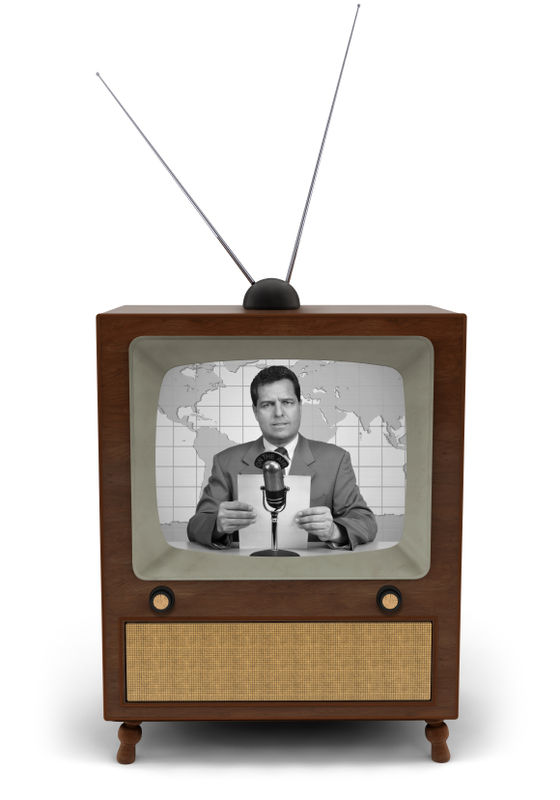 That channel was always static-laden, and required not only tinfoil on the rabbit ears, but sometimes needed my brother or me to stand next to the TV, carefully grab one of the rabbit ears, and, in my wife’s words years later, assume one of the nine basic ballet positions. (Her dad did the same thing to her, until he got angry at something President Johnson said and kicked out the picture tube. True story.) If we did the grand plié just right, the NBC channel would come in nice and clear, at least until Don Meredith dropped back for the touchdown pass and the signal would go out. The television was also a black-and-white job. So, given all of that static and lack of color, the lack of a screen display and the inability of anyone who lacked sniper-quality vision to discern what the number was on the little plastic channel dial from across the room, how were we to know what channel we were watching at a glance? Short answer, we didn’t. Longer answer, we depended on the networks, or the local station, to tell us. That involved the use of a logo, on the networks’ choice of identifying themselves — part of their branding. In those days of low, low-resolution black-and-white signals, we sometimes had to depend on the network logos to determine what station we were watching. I wasn’t old enough to see the logo ABC used in the 1950s (the letters stenciled in light gray on the side of a television camera, very unreadable), but I do remember the 1960s version: three smaller-case letters in RGB colors (they looked like different shades of gray to us) in a black circle. Easy to see and understand. ABC still uses a variant of this logo. NBC flaunted its embrace of color by pasting a color-bedazzled peacock on screen. It gave us a rather undistinctive text block at the bottom of the screen, and we couldn’t see the colors, so it didn’t convey quite as strongly (besides, no one wanted to watch NBC programs if it meant you got to stand by the antennae in allongé position for more than a few minutes). The peacock survives, in a much more stylized form, today. CBS used the “Eye of Horus” (they still use a version of it) flanked by three nicely serifed letters in a different RGB arrangement of colors — again, easily identifiable. This blast from the static-riddled past came to mind when I installed Opera 11.10 (code-named Barracuda in Opera’s best double-naught spy naming tradition) on my machine the other week. I didn’t install it the day, or the week, it came out, in part because I’m lazy and in part because I like to read up a bit on how the new browser iterations are doing before I throw my doors open and invite them in. I installed it today, or more accurately Opera got tired of me ignoring it and installed it itself, and I instantly noticed a change. 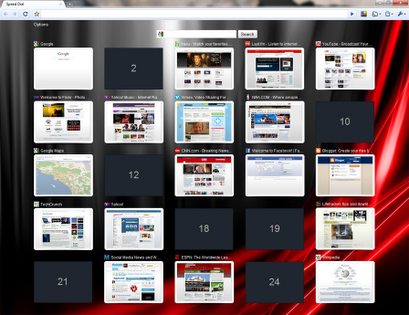 A portion of my current desktop in Opera 11. The variances in the icon displays are obvious. It was obvious how useful the little icons are. The chunky SitePoint blue/orange stylized “S” for example, is instantly discernible, as is the colorful Google Images “logo” (like CBS, they use a tastefully subdued serif font along with an array of bright Crayola colors). On the other hand, some sites not using the icons didn’t fare so well. Mine, for example. I got a nearly-random screenshot of my LinkedIn and Twitter contact icons, nearly useless for identifying anything. A Facebook page I visit regularly got turned into a blurry mush, as the program squished the entire page down into a barely discernible thumbnail shot. The screengrabs for Six Revisions and Smashing Magazine didn’t do so hot, either; without the text blocks on the bottom of those icons, I couldn’t easily tell what page it was (though Smashing’s logo is more discernible than Six Revisions’s). And who wants to rely on a text block to identify something? So, with a few minutes’ Googling, I found out that the icons are completely controllable from the client end — in other words, just like the Apple iPad/iPod/iPhone icons that we can also use on our websites (Apple calls them Webpage Icons; Android’s mobile browser uses something similar), we can add an icon that will stand out on Opera users’ Speed Dial. 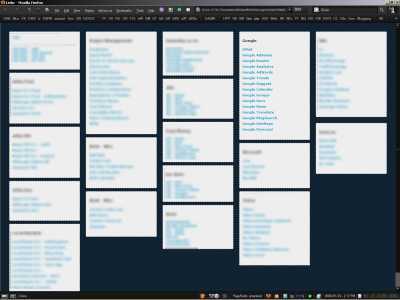 I also found that if we prefer, we can use Speed Dial-specific CSS or content, and even add a soupçon of HTML 5 goodness. In other words, we control the appearance. I don’t know about you, but in this day and age of not rationally being able to design sites that appear pixel-identical from browser to browser, I’ll take a bit of control over appearance and presentation any time I can get it. And, as we’ll see shortly, the effect isn’t limited to Opera’s desktop Speed Dial, but translates to many mobile displays as well. And doesn’t it look like a mobile desktop display? More on that later. (Not sure how to get Opera to display Speed Dial as the home page? Online How To gives a quick and easy walkthrough, though as the article notes, Opera 11 uses Speed Dial as its default for the home page selection. Here’s how to change Speed Dial icons on your, and only your, browser. And if you are new to the whole idea of Speed Dial, Opera’s given us a slick, short YouTube video to peruse.) Chrome with Speed Dial extension, in a screenshot from December 2009. (Photo credit: Technobuzz.) Firefox has a Speed Dial extension that I started using after I got spoiled by Opera’s own feature. Firefox also offers a similar extension called Fast Dial, but it seems to have some workability issues. Chrome also has an extension that gives its users a Speed Dial, and in a fashion somewhat similar to Opera, it allows for the use of site logos as dial icons, though without the customizability. Internet Explorer 9 has its own built-in Speed Dial feature that is similar to Chrome’s, though it doesn’t seem particularly customizable (I don’t use IE9, so I can’t say with any authority). Mac users have a reason to preen, as Safari has done Speed Dial for years, perhaps as far back as 2003, though I understand it’s an online app and not necessarily a browser inclusion (I don’t use Macs, either, so someone here can correct me). PCMag’s Michael Muchmore claims Opera did the Speed Dial first, for what that’s worth. The question of “why bother?” is valid. After all, Opera’s desktop browser has less than a 5% market share no matter whose numbers you accept, and I’m certain most users of other browsers don’t use their Speed Dial facilities. But that’s not the entire deal. Opera is well known as a cutting-edge browser whose best features often find their way into other, more popular browsers down the road. (A list of Opera innovations going back to 1994 is available on Opera’s Wiki, if you’re interested. Opera has introduced such features as screen zooming, user-defined CSS, mouse gestures, pop-up blocking, and voice navigation, and it’s had Speed Dial since version 9.20 in 2007.) I’m not going to start trying to sell Opera to you, you use whatever browser you prefer, but if Opera’s doing it today, Firefox and Chrome and the rest will likely do it tomorrow. So making an Speed Dial icon for your site now might only delight the very small percentage of users who use that facility for now, but chances are that icon, or a variant thereof, will come in handy for another browser’s own take on Speed Dial in the near future. 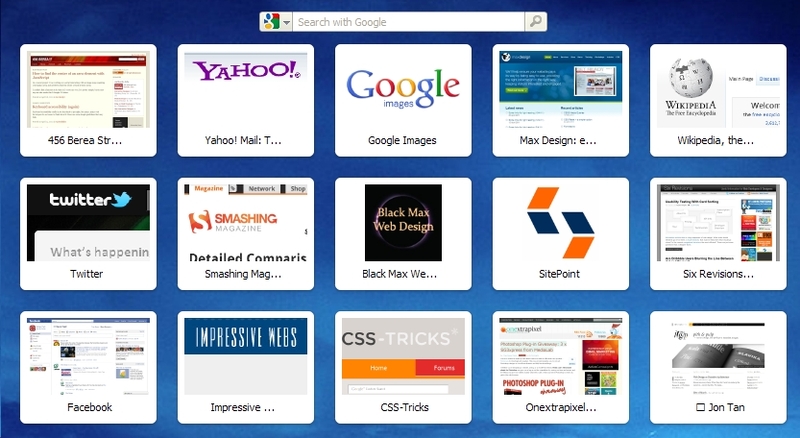 Opera’s desktop enhancements often move on to the Opera Mobile and Mini browsers, which at last take have well over 100 million users between them 100 million users”). That’s a significant user share. And, as we’ll see along the way, the same technique can be used for placing your logo on Apple’s mobile touch-screen devices. Speed Dials are nothing new, certainly. But the ability to customize them, now for Opera and almost certainly for other browsers in the near future, is something fairly different. 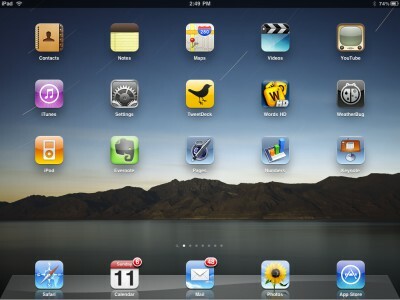 Apple iPad desktop, in a screenshot from April 2010. (Photo credit: Pat Moorhead.) It’s also becoming axiomatic that if you’re designing for the future (even if that future is next month), you’re designing for mobile. If you’re not designing for mobile, you’re not serving your clients. Author and UI expert Luke Wroblewski points out that the trend towards mobile is already large and growing by leaps and bounds, and cites the stats to back it up. A research firm made a bold prediction in December 2009 that by some time in 2012, global shipments of smartphones would surpass global shipments of desktops, notebooks, and laptops combined. That happened in late 2010, almost two years early. The gap will continue to increase. Since 2008, home usage of PCs has declined 20%, and will continue to shrink, as consumers increasingly rely on their smartphones to surf the Web. In 2011, worldwide PC shipments fell over 3% and will continue to fall; US shipments fell over 10%. Many buyers who would have purchased a PC are now buying tablets such as the iPad. 22-25% of American and British mobile Internet users don’t bother with a desktop computer at all for Internet surfing. By November 2010, the number of visitors to web-based email sites dropped by 6%, while at the same time the number of users accessing their email by their mobile devices grew 36%. And of the mobile devices out there, Smashing Magazine author Nick Francis tells us that half of the smartphones being sold today run on the iPhone OS, and half of the remainder run on the Android OS. The Apple iPad tablet is selling like crazy. Besides making me feel old (how about you? ), these stats tell me that if I’m designing for a client and ignoring their mobile needs — and particularly failing to focus on the need to address their users’ Apple devices — I’m not serving their interests. The client may not even know that you’re not giving them what they need, but it’s on the designer and developer to know that needs exists, not the client. We know that more and more of our clients’ users may still be using a desktop or notebook to access the Internet today, but tomorrow they’ll be using a smartphone, and if not tomorrow, then check back next week, because they’ll have made the switch. Moreover, they think of websites less and less as “sites” and more as “apps” (even though we know the terms aren’t interchangeable). The techniques we’ll learn here apply right now to Opera Speed Dial for the PC and for the Apple touch screens. Tomorrow they’ll apply to more devices, probably the Opera Mobile and perhaps the Mini. And, I believe, other desktop/laptop (think “fixed” computers, though the term isn’t quite accurate) as well: I have a feeling that in a year’s time, or perhaps two, a lot of browsers’ home-page displays will employ some version of a mobile-like Speed Dial facility. Let’s steal a march on the future (and on our competitors) and see how it works. The larger one will be chosen by Speed Dial as its icon, regardless of whether it comes first or second in the list. If both icons are the same size, Speed Dial will use the first and the second one will become the favicon. So far it’s been easy. The next part is, well, easy too, but allows for a good bit more customization if you choose to implement it. If you use (view-mode: minimized), you’ll trigger a Speed Dial viewport that is 256 pixels wide by 160 pixels high. That may not be an issue for you, but it’s something to know. What you definitely need to know is that if you use view-mode: minimized CSS, Speed Dial will use that as its first priority, over a more generically provided icon. Brown gives examples of several other facilities: serving a different URL via an HTTP request, cycling through a number of pre-selected icons using auto-reload, using mod_rewrite to redirect Speed Dial requests, and using a server-side language such as PHP to serve different content at the same URL. If you find these interesting, I’ll leave you to review her article if you want to explore those aspects of Speed Dial. The visual users among us might appreciate the YouTube walkthrough Opera gives us. 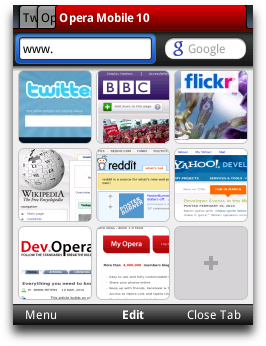 Opera Mobile, very popular on Android and Symbian devices, also uses Speed Dial, as does Opera Mini, though neither Mobile nor Mini versions allow for client-side customization just yet. (Firefox and Chrome’s mobile versions have their own versions of Speed Dial, as does the Dolphin mobile browser.) If you’re up for taking a brief stroll into the weeds, the Dev Opera forum has a discussion on Brown’s article. 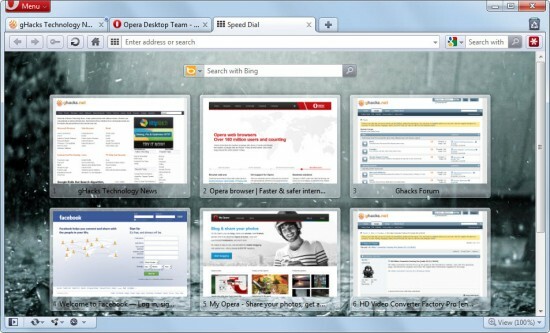 And Opera’s planning on adding extensions to the Speed Dial in the new desktop release. An older Opera Speel Dial screenshot from early 2011. (Photo credit: Martin Brinkmann and Ghacks.net, used by permission.) You saw how my computer looks with the new Speed Dial activated. 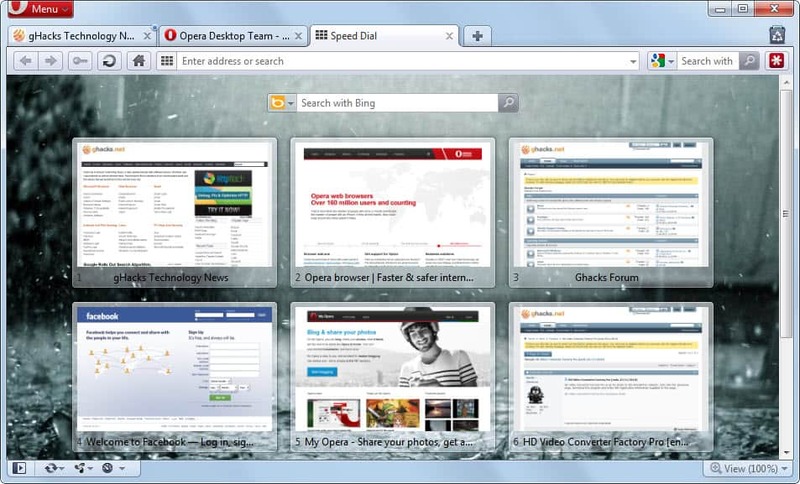 For comparison purposes, this is how the Opera Speed Dial looked before Opera 11 on a desktop monitor without the use of the spiffy new customized icons. Not bad, but you can see how some of the screen captures don’t stand out very well. Even when I zoom the graphic, I can’t tell what sites all the screengrabs represent. The point? Many websites’ “app icons” still look the same in the upgraded Speed Dial. But, they don’t have to. Four not-so-randomly selected Speed Dial icons from my desktop, circa April 2011. I just chose four that represent the idea of the customizable icon or the well-selected screenshot: Google Images, SitePoint, Yahoo Mail, and Media Matters. SitePoint uses the apple-touch-icon value in its coding, and the others either use more generic coding or just let the browser do its screengrab without any intervention. (The blue border around some of the icons is triggered by mouse hover, and comes from me being a bit sloppy as I selected the icons for screenshotting. I left the borders on some of the shots because I rationalized that we need to see what the icons look like both with and without borders, but mostly because I was too lazy to redo them.) The visual benefits are apparent. Google Images and Yahoo use their colorful text as their brand identity. 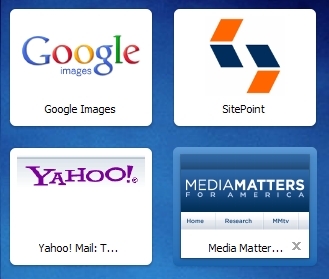 The Media Matters logo displays clearly, though it’s apparent that the “icon” is a nicely, and serendipitously, selected chunk of the top left quadrant of their display (you can see the slice of navigation bar in the icon, though I don’t think that detracts from the strong visual impact of the brand presentation). SitePoint, with the usage of their Apple icon displaying on the Speed Dial screen, probably makes the strongest impact. Very clean and strong, and instantly recognizable. Opera.com’s Speed Dial icon. Here’s a shortcut to Opera’s own Speed Dial icon. Not surprisingly, they go with their big “O” logo, though I do miss the (apparently outdated) slanting shadow behind the letter. As with all the Speed Dial icons, the text is grabbed from the title of the page, explaining why it displays as “Opera brows …” We can, of course, control that with our own sites if we want to truncate or manipulate our titles to give a short, snappy text display, and users can configure their text to say whatever they want for the icon. Apple.com’s Speed Dial icon. This is a shot of Apple.com’s Speed Dial icon. Who expected this? I was expecting some version of the “apple” logo. It stands out nicely from the pack, and the title, the single word “Apple,” is effective, though I’m not sure the photo of the iPad does the trick for identification purposes. Apple’s iPhone and iPad Speed Dial icons. Surprisingly, neither Apple’s iPhone website nor its iPad site use a dedicated icon and don’t use the apple-touch-icon coding. The screen capture for the iPhone site is fairly striking; for the iPad, perhaps less so. Perhaps Apple doesn’t expect mobile users to visit these sites? Microsoft.com’s Speed Dial icon. Here’s the Microsoft Speed Dial icon. Or the screengrab that Opera uses for the icon. Obviously Microsoft isn’t trying to comply with Opera’s requirements, or Apple’s for that matter. Like almost everyone’s “icon” out there, it’s a screen capture from the top left of Microsoft’s home page. It’s serviceable, and that’s about all it has going for it. Speed Dial icons from Wordpress.com and Facebook pages. Here are screencaptured “icons” from a Wordpress blog and a Facebook page that I work with. You can see just how unsatisfactorily these serve the purpose of branding icons. They’re just two screenshots of incredibly compressed content. Even the identifying text blocks don’t help much. NBC.com’s Speed Dial icon. And ending where we started … While the other two major television networks just let Opera do a screengrab for their “icons,” NBC gives us the 21st-century version of the venerable peacock. They code a more widely applicable JPG to serve the purpose. An early version of a homemade “app” home page. (Photo credit: Geniosity, used by permission.) The idea of a home page as a collection of “apps,” or more accurately links to a variety of user-selected websites, was not introduced with either Safari’s or Opera’s first Speed Dial. Computer maven John Dvorak has had a version of his “personal portal home page” available since 1999; all of his iterations use text links only, no icons, for faster loading time. More recently, a developer who blogs at Geniosity wrote about his own handcrafted, text-link driven home page he created for his copy of Firefox (image at left). The author tells me he still uses a version of this for his home page.There are other examples out there for the Googling. I think the idea, lurking as it has on the edges of browser conventions for over a decade, is about to step to the forefront. If it does, it will be because mobile users want their desktop, laptop, and notebook browser displays to function in the same way as their mobile desktops — as a collection of personally selected, icon-based links to sites they use on a regular basis. This will be one of the first instances of mobile browsing conventions effecting a major change in “fixed” computer browsing. I firmly believe (without any hard evidence, it must be noted) that sometime in the near future, desktop/laptop users will want to move to a Speed Dial-like browser interface that replicates what they have on their mobile devices. I see it as a sea change in browsing: instead of desktop/laptop browsers driving what mobile browsers are able to do, the reverse is going to happen. Instead of the traditional desktop “home page,” users will want a multi-app interface like they use on their phones and tablets. The wave of the future is mobile computing, and one of the most fundamental aspects of mobile computing is the app-laden desktop. The idea of opening a browser to a single home page is rapidly becoming obsolete, I feel. I started using Speed Dial on my browsers (all of them except IE) over a year ago, and I wouldn’t go back for a plateful of Grandma’s brownies. The usefulness and convenience of having (in the case of my Opera “home page”) 25 “apps” on my desktop as soon as I open my browser precludes me ever going back to a single home page again. [I]n the coming years, more and more websites will have mobile incarnations that look a lot like applications. [P]eople won’t even realize that in the end, the next generation mobile web won. to ensure full inclusion and forwards compatibility, especially if, as I suspect, Chrome or Firefox will incorporate client-side customization to their own Speed Dial (or dial extensions) in the near future. By doing it this way, you can design separate icons for the touch devices and the browser(s) that take advantage of each one’s individual characteristics. Here’s the proof in that particular pot of pudding: a before-and-after pairing of my site’s icon in Opera’s Speed Dial. For the second go-round, I used the apple-touch-icon coding so that the icon will appear on Apple’s touch-screen devices as well as in Opera’s Speed Dial. Comparison of my site’s old and new Speed Dial icons. The difference is marked. The first icon presents little more than icon gibberish; since I use text and not a graphic as an <h1> site heading in my site, Opera used some of the first graphics it came across (the three icon buttons) and went from there, providing a screen capture that does nothing whatsoever to identify my site as anything of consequence. It took me maybe ten minutes to whip out the new icon in Photoshop, write and insert the code line, and upload it. And that was with the assistance of tabby cats! You guys could do it in less, I’m sure. I’m not entirely happy with it; it’s smaller than the bookmark canvas, the corners arent’t rounded, and where the icon canvas is rectangular, the icon itself is square (if the background were white, it wouldn’t matter as much). But whereas the first icon is almost entirely meaningless, the second one conveys. allowing you to add your own effects as you desire. Opera 11.10 supports precomposed icons as well as the Apple Touch icons. Right now this works on Apple’s touch-screen devices and on Opera’s desktop browser. It’s my educated guess that within a matter of months, it will work on Opera’s Mobile browser and at a later time on the Mini as well. It wouldn’t surprise me if, by this time next year, the code string works on new Speed Dial facilities in Webkit and/or Gecko desktop and mobile browsers (be they actual browser inclusions or extensions). We might even see something of the sort in new IE versions; it’s never smart to count Redmond out. So: take a few minutes, steal a march on the competition, and add the feature to your sites right now. You and your clients will be glad you did. There is a better way to do it. Find it. — Thomas A. Edison, who telephoned when it was telephone time.